100 Crown Street, Gorbals, Glasgow. 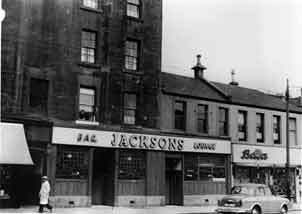 Jackson's Bar, Crown Street, Gorbals. 1960s. There has been a pub on this site since the 1870s. At that time is was a very small establishment and was later enlarged to take in the next door tenement building. Thomas Kerr a well known and respected member of the Scottish Licensed Trade was landlord in 1875. He first started out in a public house at the corner of Trongate and King Street in the city centre of Glasgow. A few years serving the locals here meant he had enough money to buy a small pub outright, at 100 Crown Street, this proved to be a wise move as it was very hard to buy your own business then. Mr Kerr was very successful here and obtained another public house at 282 South Wellington Street this street later became known as Lawmoor Street. The old pub at 100 Crown Street was known as the Old Hundredth. Jackson's Bar & Lounge, 100 Crown Street. 1960s. Thomas Kerr was born in Tollcross in the east end of the city in 1833, he met his wife Janet in the city, afterwards taking up residence at 285 Cumberland Street, Gorbals to bring up a family of three daughters and two sons, Janet C, Isabella B, Agnes S, Thomas jun, and baby John S Kerr. The family moved house often from Cumberland Street to 203 Crown Street, before moving to better accommodation in the posh area of 33 Abbotsford Place. In 1899 Thomas Kerr passed away at the age of 66, his daughter Janet was left as trustee of the businesses of which she carried on until her young brother John took over the South Wellington Street pub. Young John was then running the two public houses by 1912. The following year John sold the South Wellington Street business to William Thomson, however he continued to run the family business in Crown Street until after the First World War. 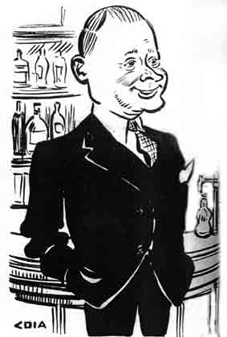 During the 1930 and the start of the Second World War Donald McNab took over the pub. He was a very successful businessman having a small empire of public houses at 41 Maryhill Road (the Highlanders Bar) McNab's Bar at 614 Rutherglen Road and 100 Crown Street. After the war John E Jackson took over the pub. Mr Jackson was one of the best known publicans of his time, having many friends in the licensed trade and in the golf clubs in and around central Scotland. In 1947 Mr Jackson was residing at 56 Croftfoot Road. He soon became a very large character in the licensed trade, he was secretary of the Gorbals Ward Committee before he was appointed Convener and representative in the Board of the Glasgow Association. John was one of the first publicans in the city to have a portable bar, he called it a mobile bar which he used when operating a special licence at functions. 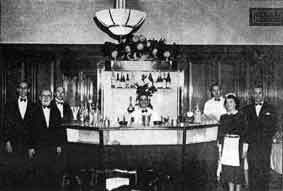 Jackson's Mobile Bar with barmen, waiters and waitress, John E Jackson on the extreme right. 1951. 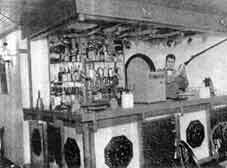 In the early 1950s John took over a public house at 91 Dundas Street which was run by James Denholm. Jackson renames the premises after a complete refurbishment the new name stood out from all the other pubs in the city and was well known as Jackson's bar before it became known as Jackson's Dog House. Jackson's Dog House, Dundas Street, Glasgow. 1961. Many trade organisations held parties in Jackson's Dog House, in 1954 popular trade personality Mr J H Wyllie, West of Scotland representative of Booth's Distilleries, Ltd, was honoured here by numerous friends in a note worthy and unique manner. Many friend turned out for the occasion including Mr Jackson,. 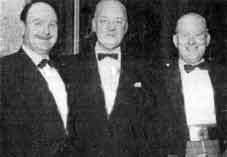 Mr George Grier, president of the Royalty Burns Club; John Raeside manager of Gordon Restaurant; Mr W Doherty manager of the Pavilion Theatre; Bob Hendry a former Queens Park Footballer. Left to right John E Jackson, J H Wyllie, George Grier, B Hendry, A C Dickson and J B Akers. 1954. As a token of esteem paid to him by his many friends. Mr Wyllie was presented with a special chair and having been seated up at the chair and raised to his place of elegance by Mr Hendry, he wa crowned "King High and Dry". Mr Hendry himself was previously honoured with the presentation to him of a special seat in the bar labeled "Hendry's Retreat." To honour the occasion a large bottle of Chief Whisky (Rintoul's) was presented by Mr Wyllie's friends. It was duly opened and its contents shared with the customers at the bar. They Tunnelled 20 ft to enter Jackson's Dog House. 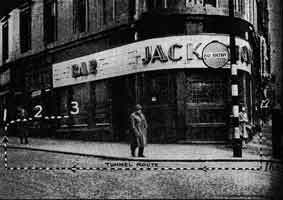 In 1954 thieves tunnelled their way 20 feet up a brick wall and breaking into three Glasgow shops at the weekend, safe raiders reached their objective, a public house safe in Jackson's Bar at the corner of Dundas Street and Dundas Place. The thieves had an hour's work to get to the safe. When they did reach it they ripped the bottom off and escaped with about £30. C.I.D men found that the thieves had started tunnelling from the basement of a nearby close. From there the raiders had tunnelled 20 feet, then knocked a hole in the wall of a music shop. Inside this shop, they crossed to a wall next to a florist's and smashed their way in. They next knocked another hole in a wall leading to the public house. The raiders escaped by the same route. This photograph was taken in December 1955. On the occasion of the opening of Charles Watson's new bar. Mr Charles Watson's Old Vic Bar at 669 Govan Road, had a new bar fitted, and there to wish Mr & Mrs Watson well with the new venture were some of the well known personalities in the trade, including, G C Millen, N Foulger, George Grier, I Sinclair, John E Jackson, C Cullen, J H Wyllie, W Johnston, R Lemon and J Millen. They drank a cordial toast to the Old Vic and Mr & Mrs Watson. John E Jackson with a noose around his neck. 1956. This photograph was taken on the occasion of a portrait of Mr Jackson being hung in his Crown Street Bar, known as the Old Hundredth. Mr Jackson and Mr Grier were firm friends, and, with their wives, have on several occasions gone holidaying together. The portrait was handed to him by members of the Gorbals Ward Committee as Mr Jackson announced his retirement of the convenership of the Ward. John E Jackson with friend H W Carmichael. 1957. 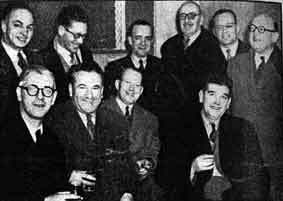 Top: John E Jackson and Mr S Guymer; middle: Mr C Watson, Mr D Garrow and Mr A Thomson, Oakbank Bar; front: Mr N Foulger, secretary of the Govan Ward. 1958. This cartoon of John E Jackson by drawn by Coia. 1958. Mrs & Mr John E Jackson. 1960. This photograph was taken at 100 Crown Street in 1960. 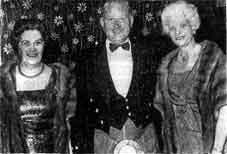 John E Jackson, with friends Donald MacLean of the Coronation Bar, Rutherglen Road; Mrs Jackson and Mr A M Don, managing director of G & C Moore Ltd. The photograph above is of Mr Tom Wilson, Council officer for the City of Glasgow, on retiring after 30 years service, was the principal guest at a party given by John E Jackson, at the Neuk, Carmunnock. The occasion was marked by the presentation to Mr Wilson of a set of Golf cuff links, one of them bearing a watch. This gift was handed over by A M Don, managing director of G & C Moore Ltd. on behalf of Mr John E Jackson. 1960. Left to right Mr D D Rennie, of Booth's Gin; Mr John Young, "The Wee Mans", Gallowgate; and John E Jackson. 1962.
right to left John's sister Mrs M Harris, Polonia Restaurant, London; John E Jackson and John's wife. 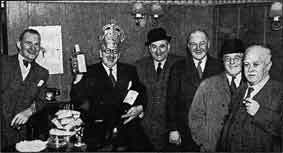 1962.
right to left Mr B Brind, managing director, Sir Robert Burnett & Co., Ltd; John E Jackson and Mr A McAulay, ex-Kyle's of Bute Bar, Govan. 1962. This 1960s photo was taken at the Gorbals Association outing. The three bunneteers; John E Jackson; George Grier and Mr J McIntosh. Mr John E Jackson. 1960s. Mr Jackson with full celtic attire. 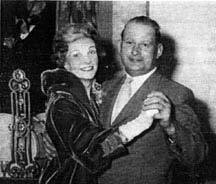 John E Jackson had a new adventure in the later 1950s. He opened a new lounge bar in Carmunnock called "The Neuk." His new venture was situated five and a half miles from Glasgow in the old world village Carmunnock. For many years the Neuk was a tea-room. Repeated attempts were made for a licence but although the lower court granted the application on several occasions the decision each time was overturned by the Appeal Court. 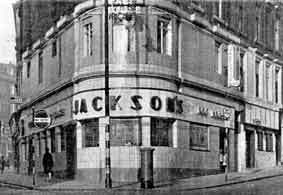 Mr Jackson, Glasgow Licensee, ultimately took over the premises and on him making a seventh application it succeeded at both Courts. Exterior view of the Neuk Carmunnock. 1961. To Mark the opening of the premises in their new form. Mr & Mrs Jackson were recently hosts to a party of Trade friends and personalities. The honour of performing the opening ceremony fell to Mr A M Don, Managing Director of G and C Moore Ltd. The Staff with John E Jackson, the Neuk, Carmunnock. 1960. Referring to Jackson's two other enterprises, the Dog House in Dundas Street and Jackson's Bar, 100 Crown Street. Mr Don remarked on the success Mr Jackson has made of both these premises. He recalled that Mr Jackson in his youth was employed in the Dundas Street premises when it was a restaurant. The progress he had since made was a great credit to him. Under the supervision these new premises would prove an attraction in Carmunnock. Interior view of the Neuk. Christmas 1961. The new Neuk, which surely ranked as a Carmunnock showpiece, moulded into the character of the village. With its tudor exterior in black and white and its rows of 16 hanging wrought-iron lanterns it presented a picturesque appearance. The alcoved, carpeted Tudor lounge bar had its counter panelled in rough-cut slices of elm and sycamore straight from the tree. In building up the old world atmosphere, Mr Jackson had been helped by friends, and he had been given three nag-at-the-wa' clocks, one of which is 200 years old. Perhaps because it was at the seventh attempt that an application for a licence for the premises was successful that the bar downstairs had been named "Bruce's Cave." It was really is shaped like a cave. On the floor was a Bruce tartan carpet. On the curved walls were swords, a breast-plate and helmet, and bagpipes. 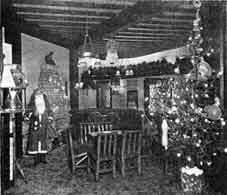 Customers food was to be an attraction to the Neuk, where a well appointed dining room had accommodation for 30 patrons. The Neuk manager was Mr Charles Meranghi, who was for many years an experienced head waiter in the restaurant business. Santa at the Neuk, Carmunnock. 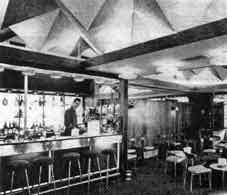 In 1962 Mr Jackson's empire of licensed premises flourished, he opened yet another establishment the Lanarkshire House. A road house atmosphere with a Continental trend that is what he had achieved at the Lanarkshire House, Halfway, Cambuslang. The premises occupying a prominent corner site of the main road at Halfway, were replete with interesting designs, have an unusual blend of fabric and material, and delight the eye with striking colour. The architect drew his material from Italy, Denmark, West Germany, Africa and Japan. Exterior view of the Lanarkshire House, Halfway, Cambuslang. 1962. In the forecourt were four illuminated fountains, a new feature in Lanarkshire at the time, with attractive paving and three simple wayfarer seats. The exterior wall had an abstract design in mosaic representing tap founts and bottles. This is British designed. The Lanarkshire House speaks travel along the Hamilton Road. 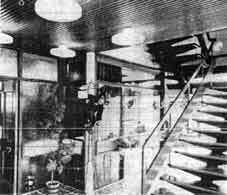 The entrance hall featured a terrazzo floor, German light fittings and most impressive a free tread cantilevered staircase made from Afromosia, a wood from Africa as durable as teak. The entrance gives access to a cocktail lounge and restaurant. 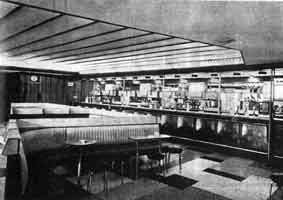 The Large public Bar. 1962. The ground floor cocktail lounge, known as the "County" is cosy and captures the style of decor... mauve carpet, flood-lit flame coloured curtains and olive walls. 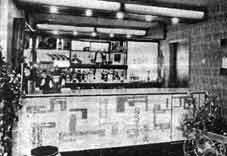 A decorated screen at the right of the bar is modernistic, using coloured glass bricks and coppered shapes. Here there are prize-winning design chairs made in Scotland. The lighting effects in this lounge are Danish. Cocktail Bar in the Lounge. 1962. On the back wall of the stairway, a wall-paper mural captures the same colours as the restaurant carpet, green, orange and olive. The bar in the restaurant is spectacularly fronted with alternate panels of Italian marble and natural cowhide. There are three raised flood-lit ceilings in this room, which also contains the dance hall area and band platform. There is a resident band. Supper dances are being held every Thursday, Friday and Saturday. The Lanarkshire House bar has the ingle-neuk, alcove and island seating arrangements. A surprise item in the decor is the wall-panel of Japanese sea-grass. The Bar here is cheerfully illuminated and the copper mirrors give a flattering glow. The restaurant caters for 100 people, and Mr Jackson is so certain of its success that he is already considering an extension. The manager of the Lanarkshire House was Mr Marcus Marenghi the head barman, Mr Stepanek and the head chef, Mr John McConnell. The Lanarkshire House Dining area. 1962. 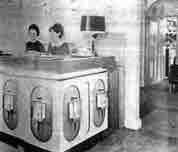 Mr Jackson recalled that 20 years ago a lounge bar was a complete innovation. Now he said its a necessity. In the old days too the pub was a man's world of drink, darts and dominoes. Now it has been invaded by the wives, and its no secret that they're the bigger buyers. "When a couple have an evening out nowadays the woman, with her fancier drinks, accounts for about two-thirds of the bill. And, of course, she's always on hand to let her husband know when he's had enough." The interior entrance hall with stair-case. The Neuk, Carmunnock was destroyed by fire in 1965 and was refused a licence to reopen the premises. On that same year Mr Jackson opened the Garfield Hotel, on Cumbernauld Road. A seven day licence was finalized by the Lanarkshire Licence Courts, an agent on behalf of Mr Jackson agreed on conditions by the court that alterations and the construction be completed before the scheduled operation on June 30th 1965. The Garfield hotel was prominently positioned at the end of the dual carriageway running to the new town of Cumbernauld. It was designed for the traveller and tourist in mind. The decor theme chosen for the hotel was based on vintage cars, which was imaginatively used throughout the hotel. The 19th century mansion house was skillfully preserved in the alterations carried out by adding a large an imposing new wing, completely modern ito its design. 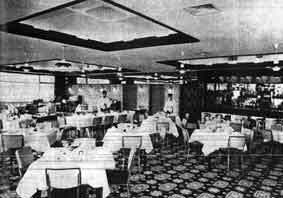 Garfield Hotel had 20 bedrooms, a main dining room with seating for 150 people for functions, a breakfast room, a lounge bar, a cocktail bar, public bar and residents lounge. Georgian green, close fitted carpets laid in the entrance hall, reception area, staircase and throughout the residents lounge, which linked the new and older section of the hotel. The heavy wood on the staircase and the stained glass windows was a feature of the hotel. Vintage and classic cars was the theme of the hotel, with framed pictures adorning the walls. The theme continued throughout, leading off the reception hall was a wire wheel cocktail bar. Seating here was deep buttoned in natural tan leather and the carpet was also in green with curtains in two tones of green with vintage cars in bright colours. Chairs were of natural mahogany with tables in green marble. The main bar in the hotel. 1965. The reception Hall at the hotel. 1965. The resident manager of the hotel was a Mr G Fitzpatrick, who held a diploma from the Scottish Hotel School and who had extensive experience in management of hotels of all kinds. He was assisted by his wife in the running of the business. Head barman at the wire wheeled cocktail bar was Mr James Martin. The chef was Mr G Kousorou formerly of the Ca'doro Restaurant, Glasgow. Head waiter was Mr Frank Naismith. 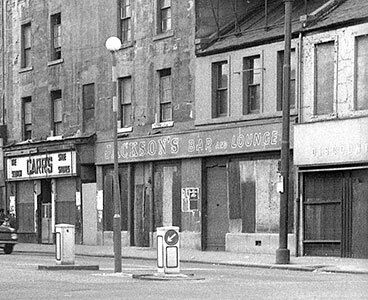 Mr Jackson's empire didn't end here, he took over the well known public house "the Regal"
Less than 2 years after the opening of the Garfield Hotel, Mr Jackson went bankrupt, this was a sad moment for one of Glasgow's well known and colourful publicans. Mr Jackson held a meeting of his creditors in the Chartered Accountants Halls, 220 St. Vincent Street, Glasgow. Mr Jackson who resided at 18 Gordon Road, Netherlee, disappeared from the public meetings and licensed trade meetings, that must have been a sad moment in the Scottish Licensed Trade. Trophy night for the winners of the Glasgow woman's darts league at the final of their competition for the Kensas Club Darts Trophy in the Grosvenor Hotel, Glasgow. Winners were the Garfield Hotel team from Stepps, who beat the girls from the Sou Wester Bar, Gorbals, Glasgow. 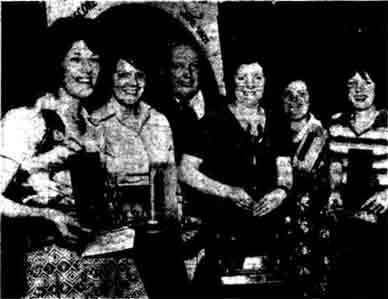 Left to right are winners Nancy Taylor, Carol McKerron, Gil Brodie, area manager for Gallaher cigarettes, Margaret Devlin (team captain) and Janet Taylor. 1976. Two raiders attacked the chargehand of a Glasgow public house and got away with about £200. The chargehand, Mr Frank Robertson, was alone in Jackson's Bar, 100 Crown Street, checking the week-end talkings when the raid occurred.